In my last post, I started creating the dominoes to complete the copy of Stickman #16, the Domino Box I had recently acquired. 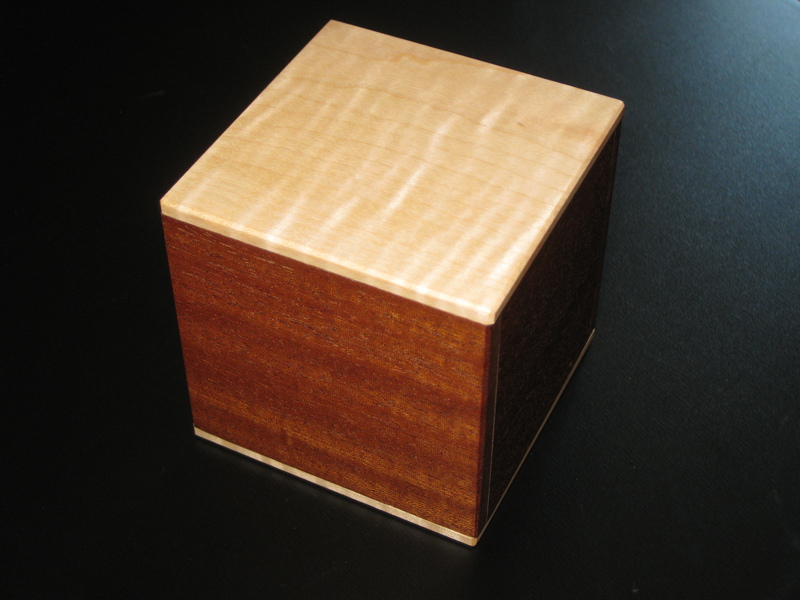 In this post, I'll finish making the dominoes and review this very tricky Stickman Puzzle Box. Once the box is filled with dominoes, plus a couple of additional pieces that Stickman created to fill the space, the previous solver can shuffle the dominoes, effectively creating the starting point for the next solver. But before I get to the review itself, I still have to finish making the dominoes. If you're only interested in the review, then jump here. I spent most of my Sunday morning putting together a new jig just to put the centre line in the dominoes. As you probably remember from the last post, I finished up having cut the spots, but still had the challenge of creating that centre line split that all dominoes have. I needed to be able to do this quickly and accurately, and also had to take into account that tearout was possible when cutting across the grain of the wood. Had I been sensible, I'd have cut the centre line before creating the bevel, making tearout a much lesser issue, since the bevel would cleanup any possible tearout. Given that I didn't do that (live and learn!) 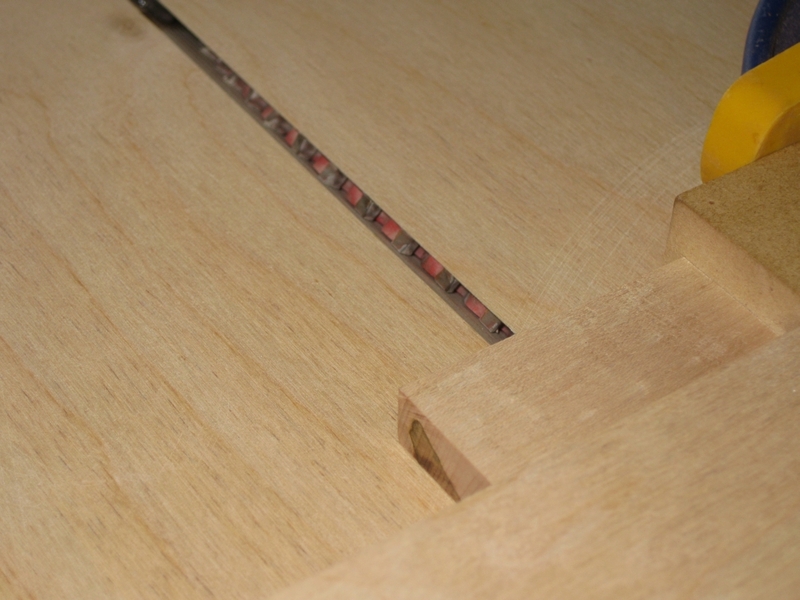 I had to create a crosscut sled, with the blade angled at 45 degrees to the table. This allowed me to cut using the corner of the blade, and create the desired effect. Although it may look like the blade is inside the jig in the picture above, it's actually 1/64" above the plane of the jig. Just enough to cut the shallow groove I need. The first attempt, I had my stop block slightly off, so the cut was fractionally too wide and left a hill in the centre of the domino. A quick adjustment of the stop block, and the test domino looked good. 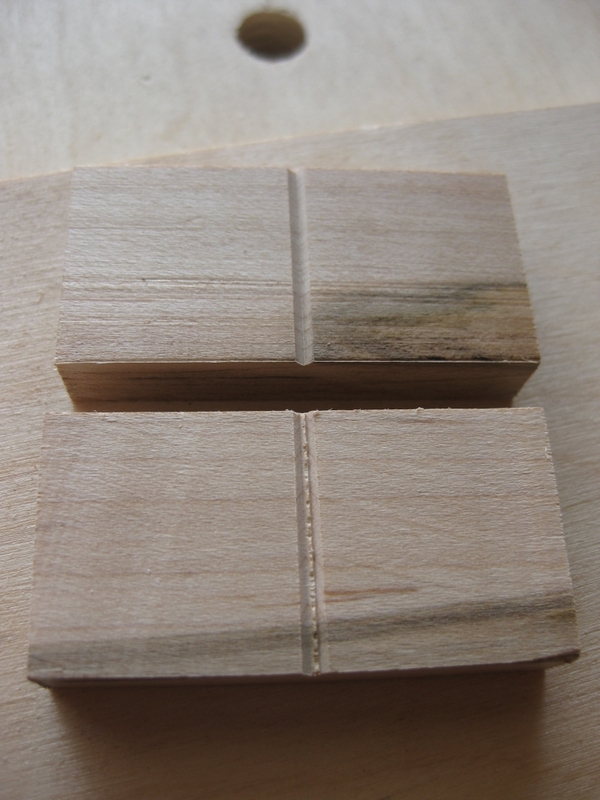 The benefit of having the stop and this jig is that the cuts are repeatable, and very quick to make. It takes less than 10 seconds per domino. Half an hour later, I had two full sets of dominoes finished. Now of course there's some final sanding and finish to be applied, but the dominoes themselves are complete, and could be used in the puzzle at this point. It took two days over two weekends to make the two sets of dominoes and was time well spent in my mind. There's another Stickman puzzle (two in fact) which are now complete and will hopefully allow these excellent puzzles to be enjoyed by many more people. So with all the work I put in to completing this puzzle, was it worth it, and is the puzzle any good? 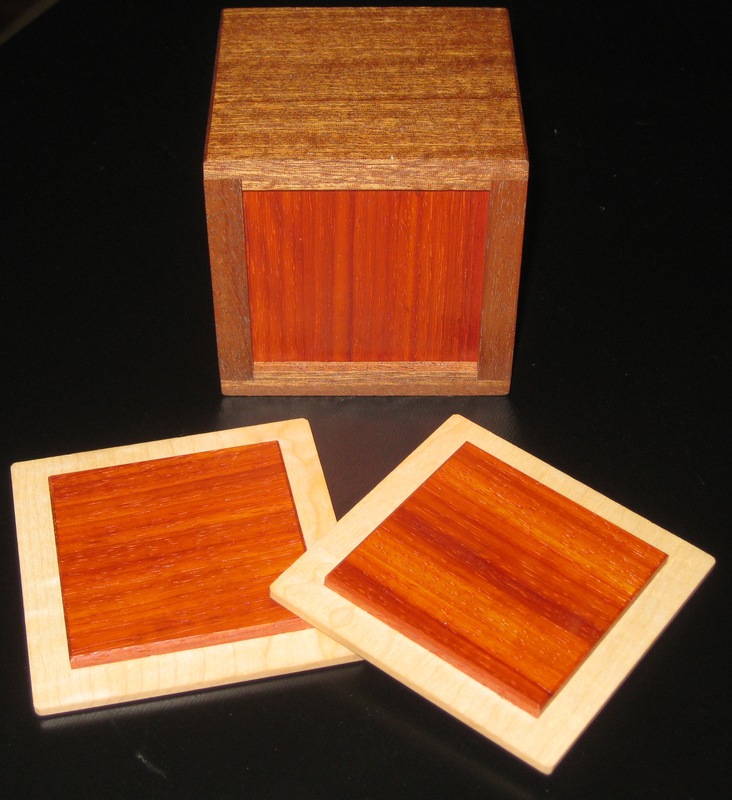 The puzzle measures 6" x 6" x 2", and has enough space to store a regular set of 6 spot dominoes (that's 28 if you weren't sure), as well as a few additional shapes just to make things interesting. 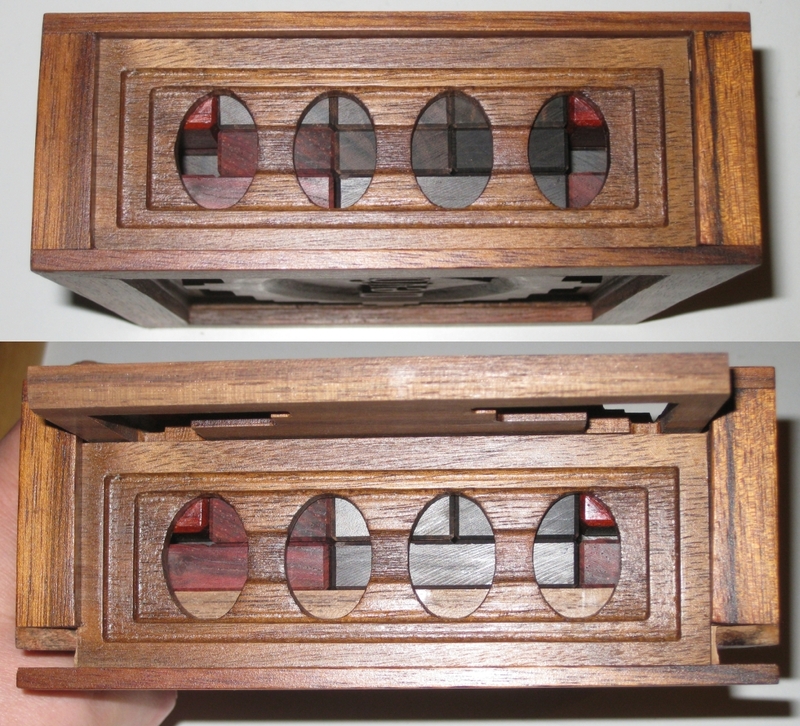 Made from Walnut and Monticello it's a sturdy box, which with all the ornate work on the top and bottom makes it a great looking puzzle. 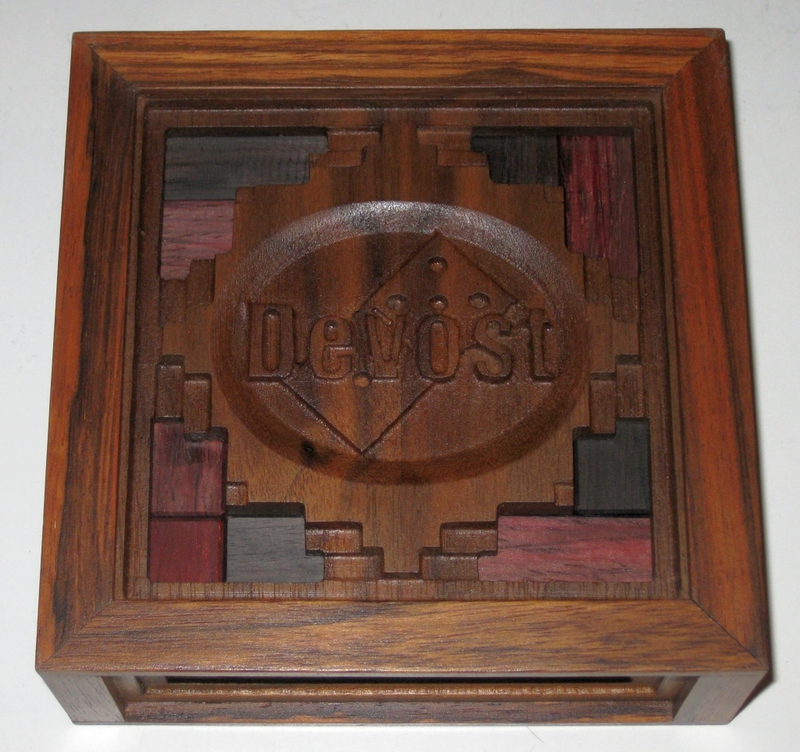 With the Stickman logo on the top, the Domino and Devost on the bottom to signify that the dominoes were made by John Devost, this stands out on the puzzle shelves. Of course in my case, the dominoes were made by me, and this is the only set of dominoes in the run of boxes to be made from Ebony. 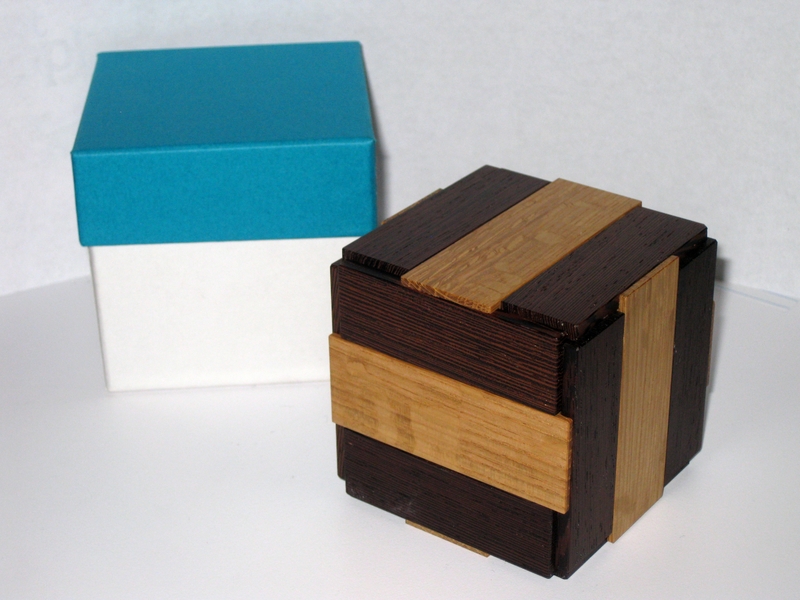 I was very lucky to get the Ebony blocks from John through Stickman, so this is the wood which was intended to be with this box. I'm incredibly happy that some of the Ebony has the amazing red tint to it. Sadly, over time this will oxidse into the dark rich black that is normally associated with Ebony, but for now I'm going to enjoy this wonderful hue. I think this probably qualifies as one of the simplest mechanisms in a Stickman Puzzle that I've come across. 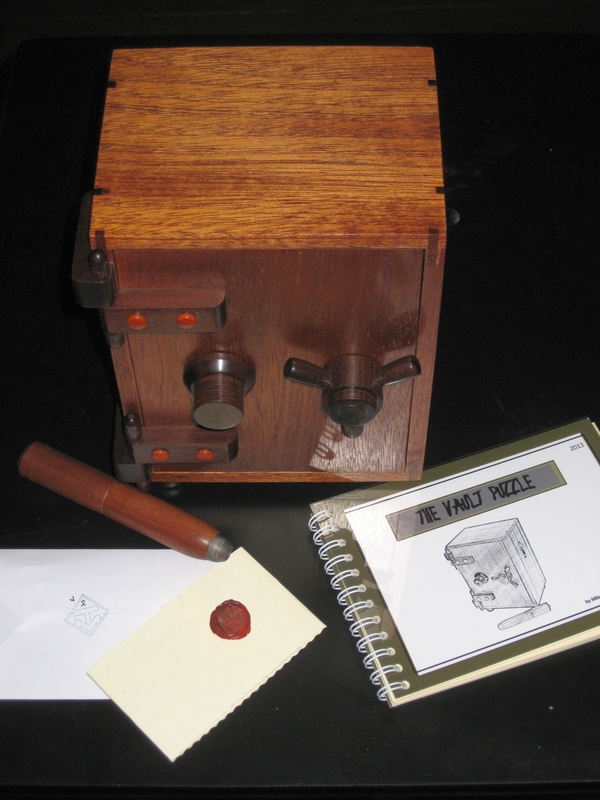 If we break it down to the bare minimum, it's a box, with a sliding lid, and two blocks glued to the inside. Don't read that the wrong way, the craftsmanship in this puzzle is everything you'd expect from a master craftsman like Stickman, and given the CNC work, it's one of the more ornate puzzles he's produced. It's up to the puzzler to insert the dominoes into the box, in any orientation he desires along with the additional pieces, close the lid, and then shift a few of the dominoes around to lock the puzzle. 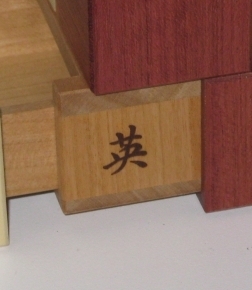 The challenge is then to return the dominoes to their original position which leaves a small gap at each corner on the front of the puzzle, allowing it to be opened. The Upper image shows the gaps which have to be created. 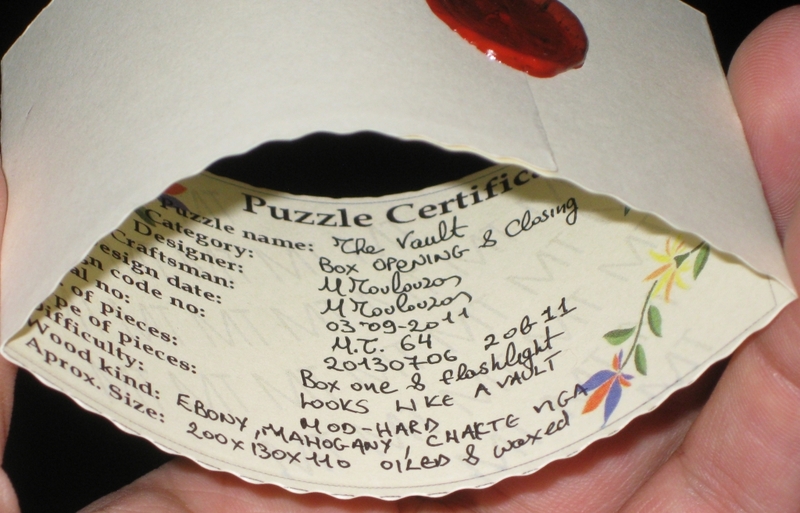 Looking through the two outer holes in the box, there's a gap in the middle layer of tiles. 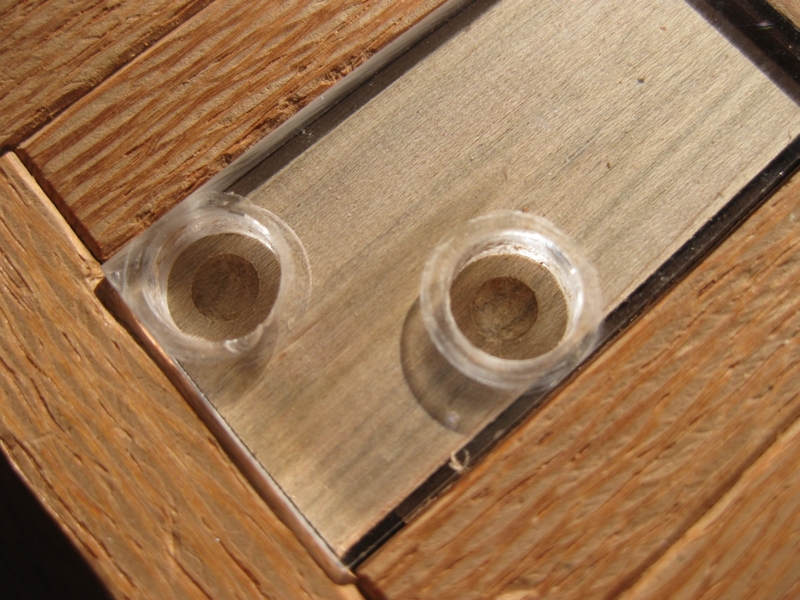 The top two reddish bricks at the top are the two which are glued to the frame and make the locking mechanism. Once those spaces are clear, the front can be slid down, allowing the top to slide part way out, allowing access to the dominoes. 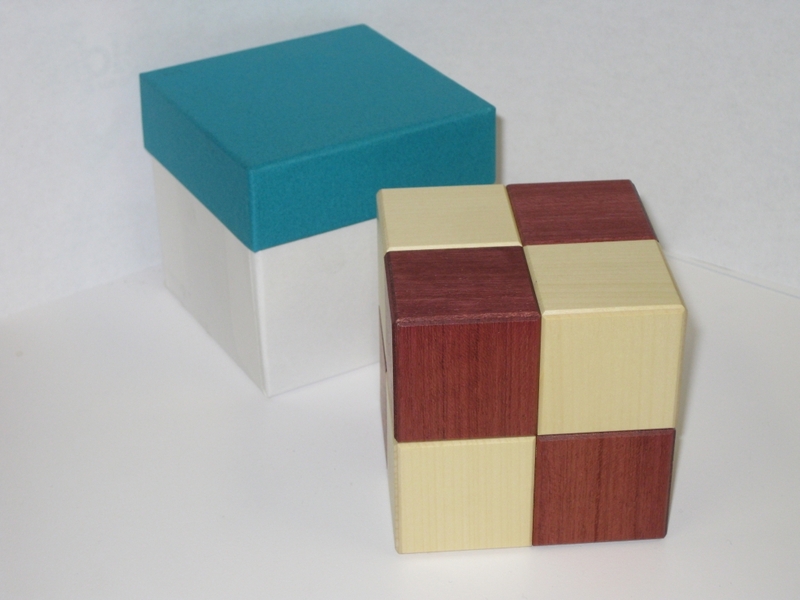 In terms of the difficulty, this is a very challenging puzzle. Those holes which are all around the box look huge until you try to move a domino inside the box, and realise that the gaps are not as large or as helpful as you might like. I found myself often tapping the side of the box against my palm to cause a domino to slide where I needed it. 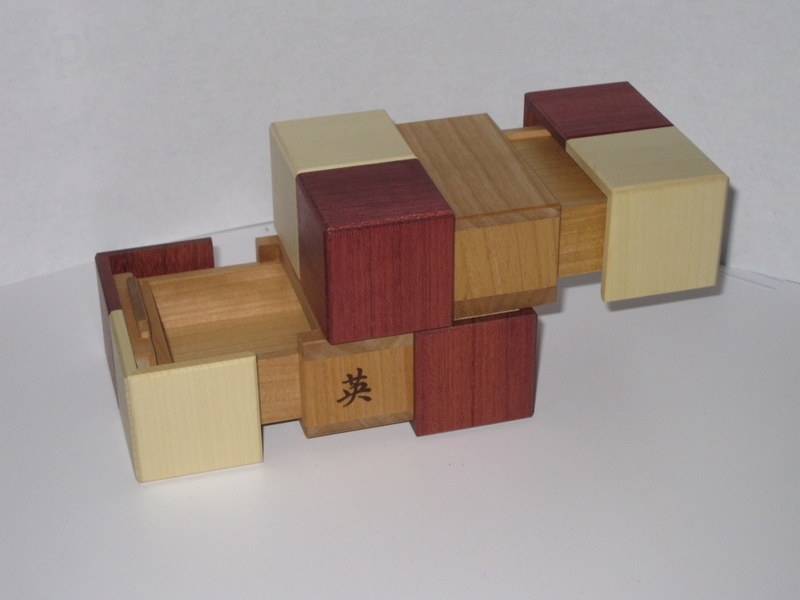 Moving dominoes between layers is especially tricky, and it's not had to create a state inside the box that will take a lot of time to solve. Even Stickman himself admits that he found himself locked out of the box for hours. 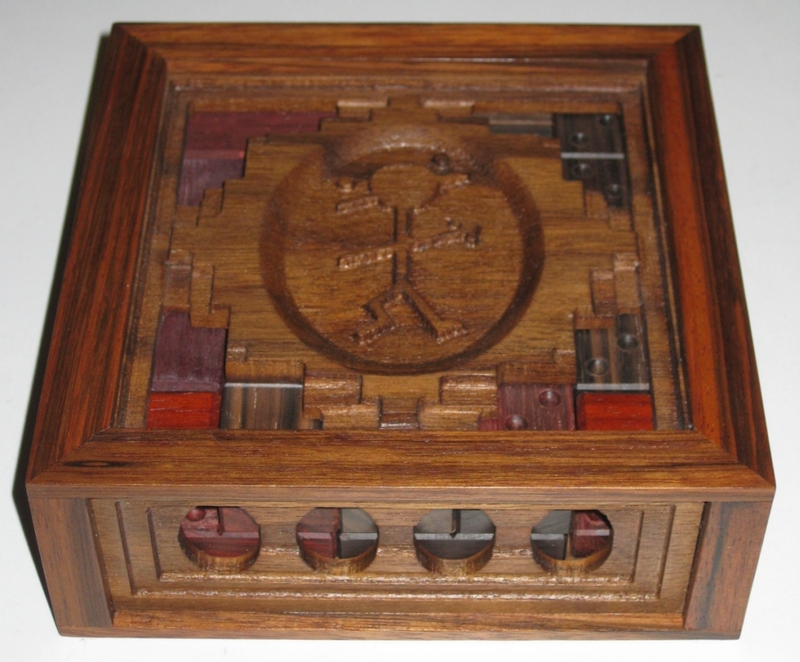 I really like this puzzle box, and it doesn't hurt that once you solve it, you can go ahead and make use of the dominoes inside. I'm very pleased to have been able to turn this into a working puzzle and I hope this will give more puzzle enthusiasts a chance to play with another Stickman design. Every now and then an opportunity arises to take a puzzle in potentia, finish it, and bring another puzzle into the world. I recently had that opportunity with one of Stickman's puzzles. At a recent auction, I was bidding on a copy of Stickman's Domino Box, and given that I'm friends with the man himself, I was talking to him about it. He happened to mention that he had a carcass of the puzzle that just needed the dominoes made for it. 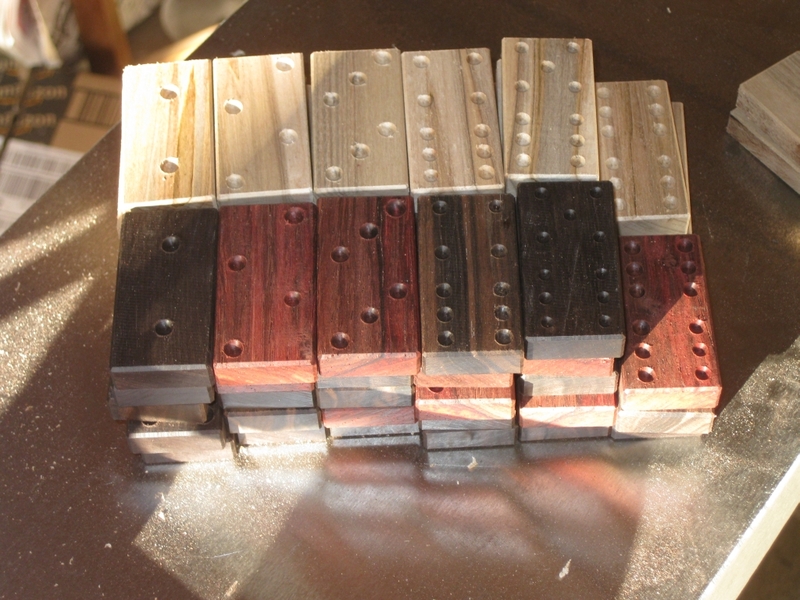 He even had the blocks of Ebony to make them. 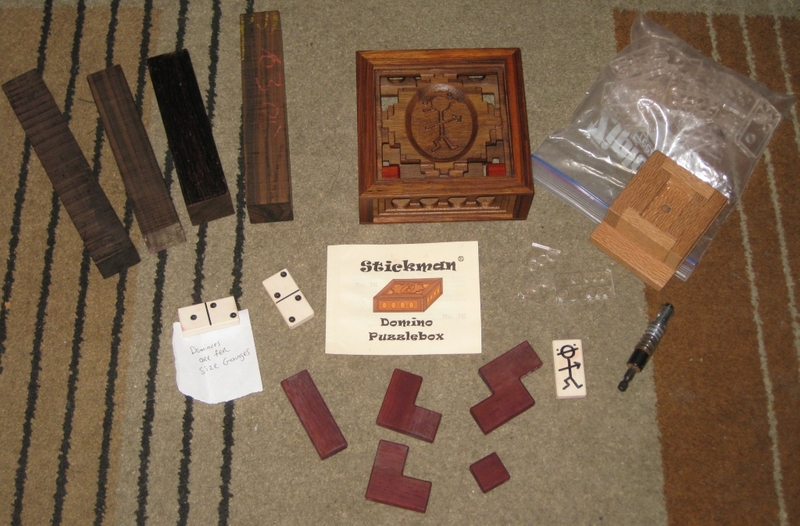 The Domino Box was a joint venture between Stickman and John Devost. 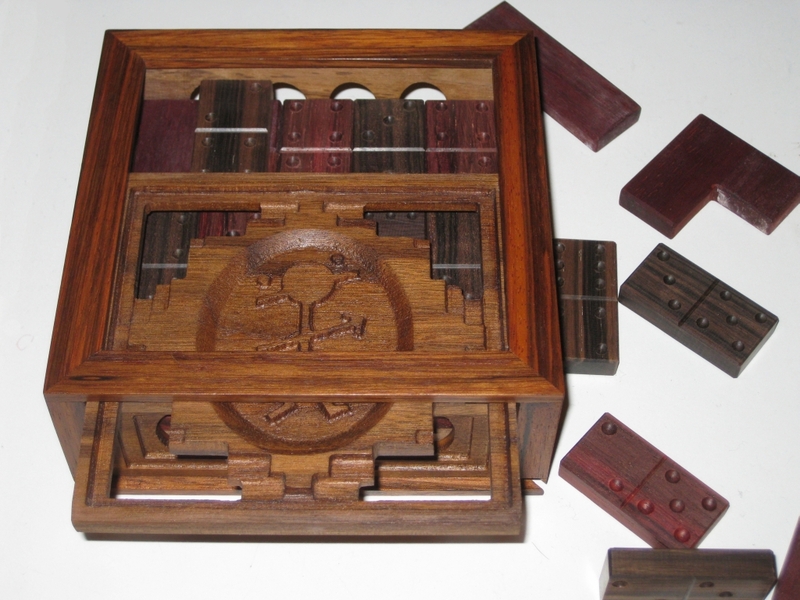 Stickman made the housing for the dominoes, and the extra 'bits' that for the mechanism of the puzzle, and John Devost made all the sets of Dominoes. Turns out neither he nor John Devost had the time, or motivation to make the dominoes, so Robert offered me the chance to take that copy instead of the one I had won at auction. I'll not go into the details, but both myself, and the person I was bidding against got a great deal on the puzzle, so it was a win-win situation. 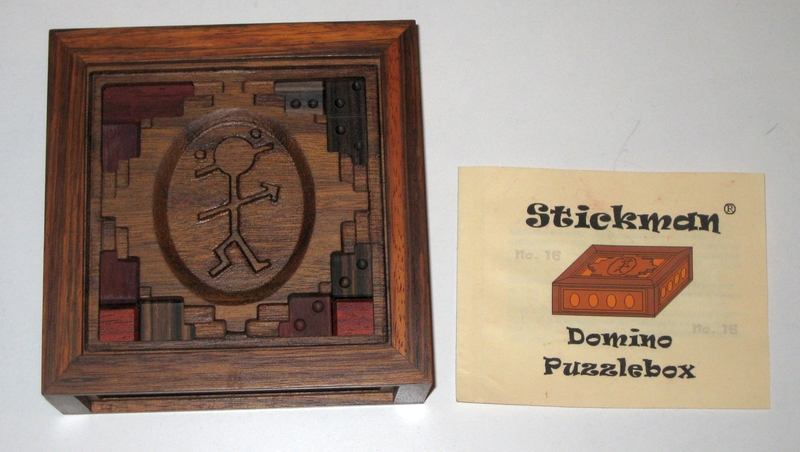 What arrived from Stickman was everything needed to make the puzzle functional. 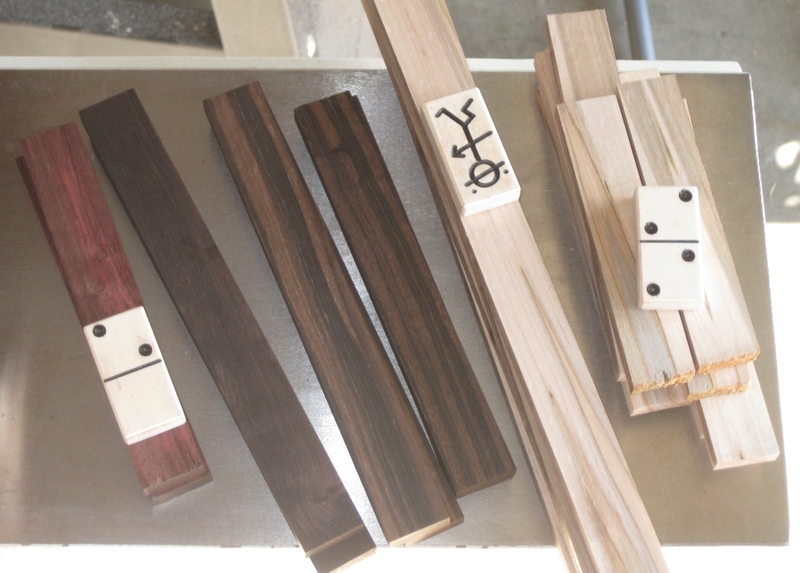 As you can see in the photo above, I received four blocks of Ebony, the carcass for the puzzle, a bag of domino templates, the special drill bit to cut the spots, and a jig to help in cutting the spots. 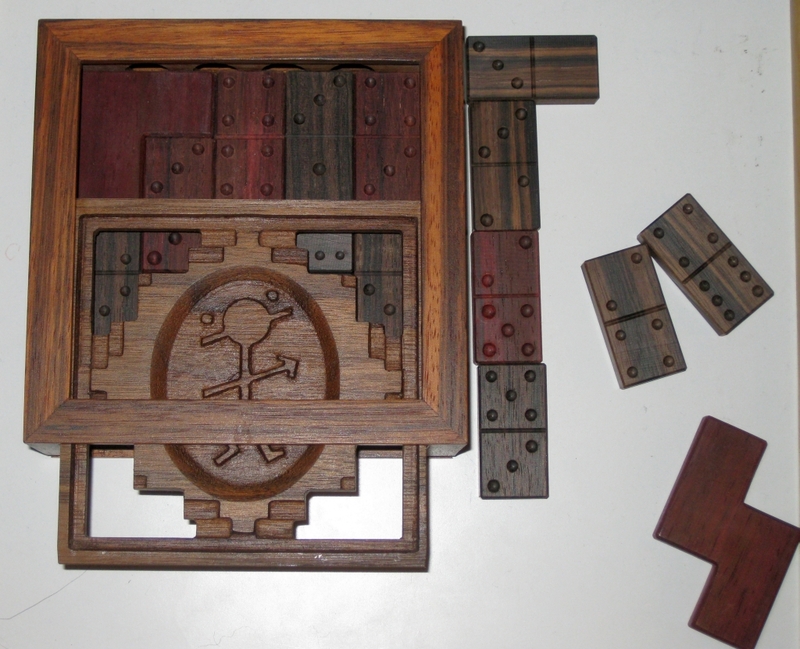 There were also some original dominoes cut by John Devost for sizing, the interesting shaped pieces which are part of the mechanism, and the original puzzle booklet. It's quite the collection of pieces, however it was going to need some work to make it into a Stickman. 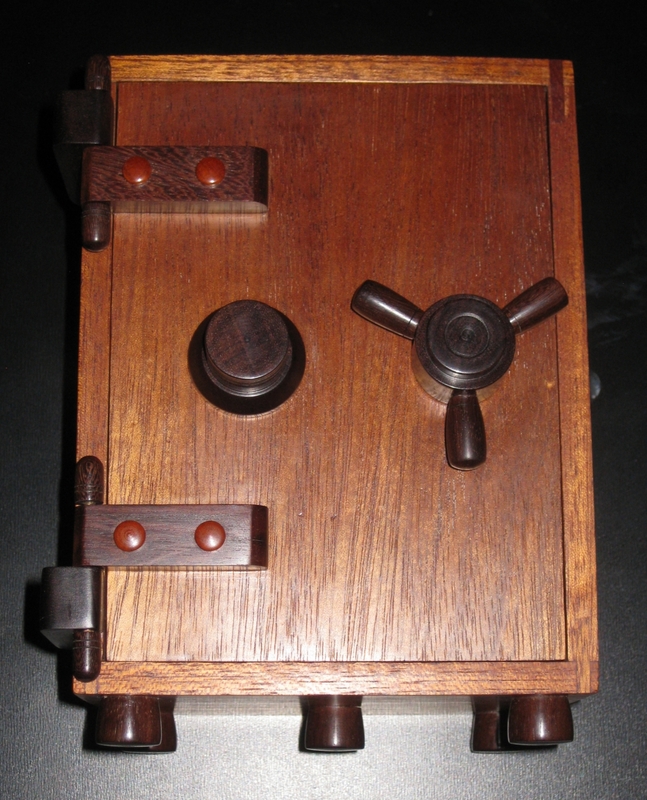 Originally, this was to be a special edition, with the Ebony Dominoes however as often happens with a run of puzzles, toward the end the last couple never quite get completed. Having everything I needed, and not having the drain of completing 25 copies of a puzzle, the motivation was there to make up the dominoes. 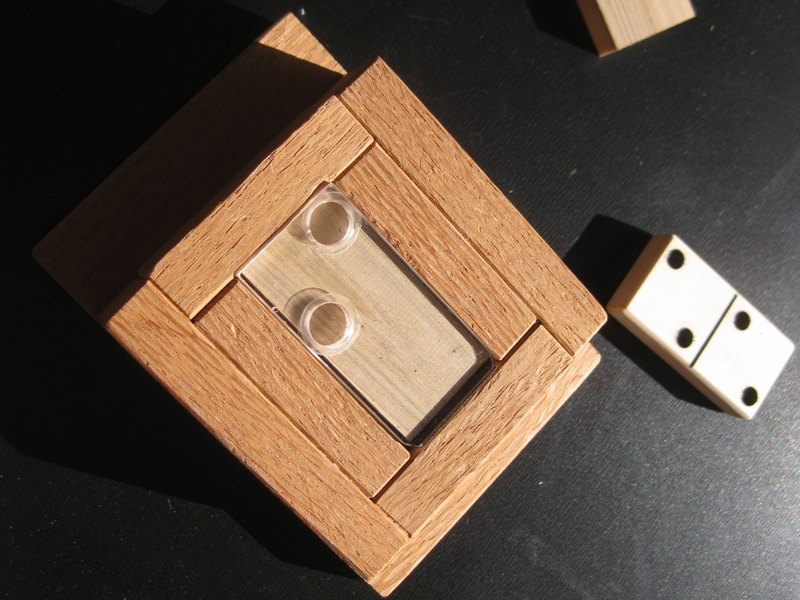 This post will show you the process of making up the set of dominoes to turn this into a functional puzzle, and add a unique copy of the Domino Box to my collection. Not long after I received the kit, I heard from another puzzling friend, over in the land of Oz who had heard through the puzzle grapevine that I had all the necessary 'bits' to make up a set of dominoes. He asked if it would be possible to create a set for him while I was making my own as he also had a carcass that needed the dominoes. Making two sets, isn't a lot more work than making one, so of course I agreed. 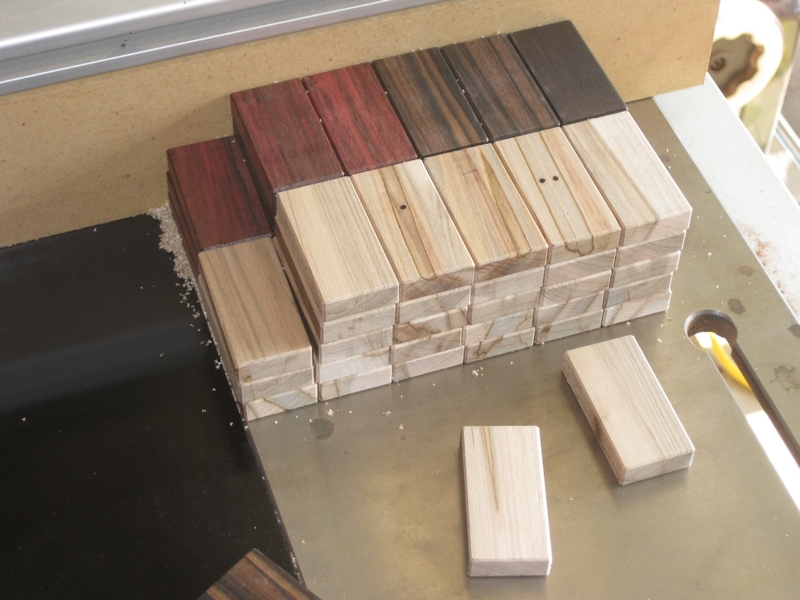 I also had to be very careful when cutting the blocks to size, as there was some significant checking running through the entire block in two out of the four wood blanks, which would ruin a domino if the checking came through the piece. Fortunately, the block was thick enough that I could cut it and avoid the checking, to get just enough stock. With the stock milled to the correct thickness (10mm) for the dominoes I had a set of boards, which as you can see are wider than needed for the final domino blanks. The lighter stock is Ambrosia Maple. I had picked up a beautiful board at a recent trip to the lumber store, and despite not knowing what I'd use it for at the time, I couldn't pass up such a stunning board. When I was asked to make the second set of Dominoes, this seemed like the perfect use for some of that board. 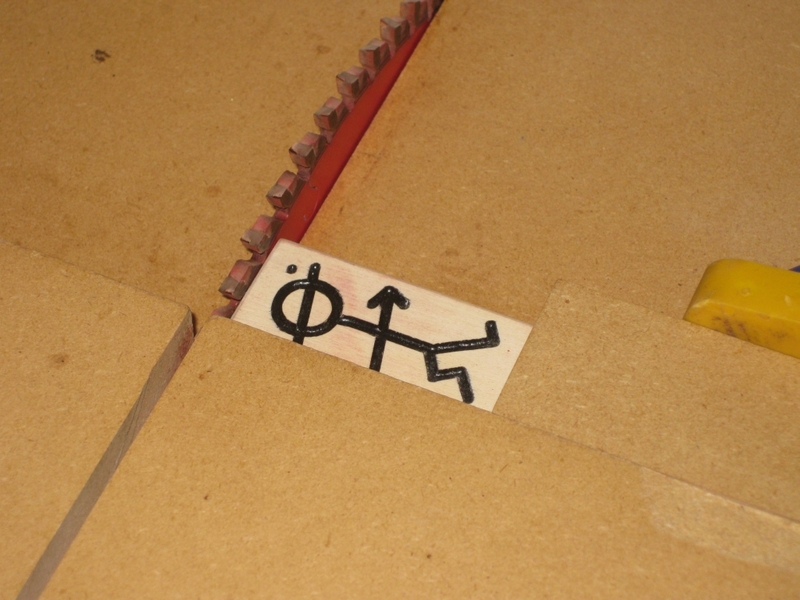 Having used the original dominoes Stickman had provided, I cut the long strips of wood to the correct width, ready for making into the domino blanks. 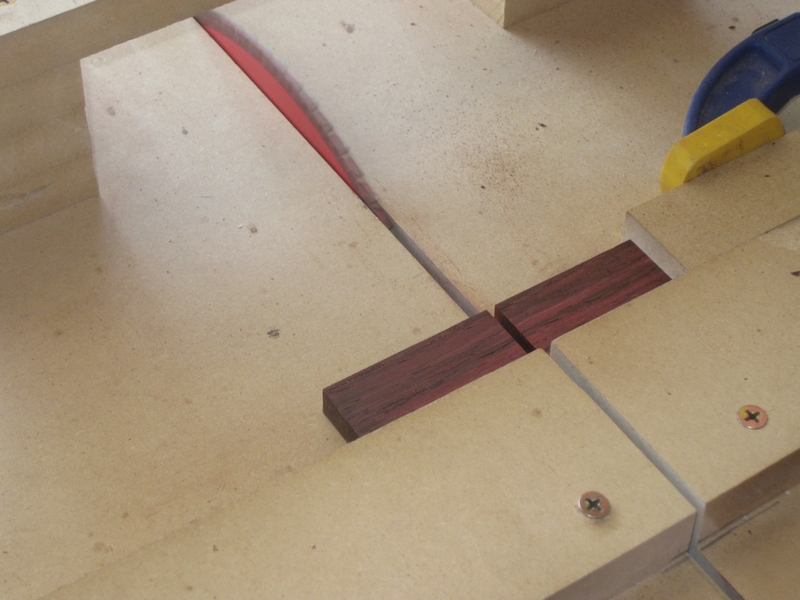 With my crosscut sled, I took the original domino and used that to set my stop block to allow me to quickly and accurately cut the blanks to length. Each long stick has its end trimmed on the sled to make sure that it is absolutely 90 degrees to the long edge, and makes sure it will be parallel to the other end when cut to size. After that, it's a simple process of placing the stick against the stop block, and pushing the sled across the blade. 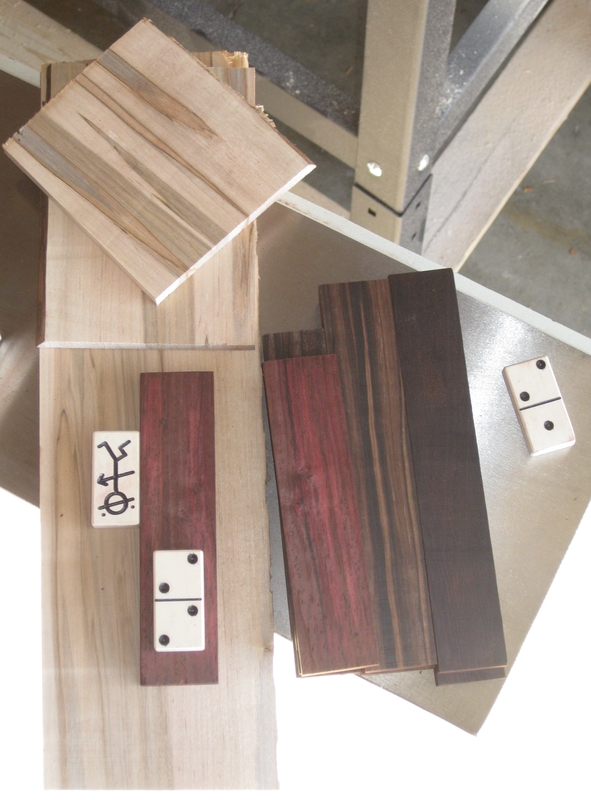 Each domino blank is perfectly sized, with very little work needed. Before long I had a couple of stacks of domino blanks. There was enough wood to get exactly 28 blanks from the Ebony. I had a little more of the maple stock, so I cut a number of spare dominoes just so that I had extras to test out each additional step in the process. After all, I had no room to screw up with the Ebony stock. In the back left of the image are all the offcuts from the stock. I'll certainly not be throwing all that Ebony away. I'm sure it will make its way into another project at some point. 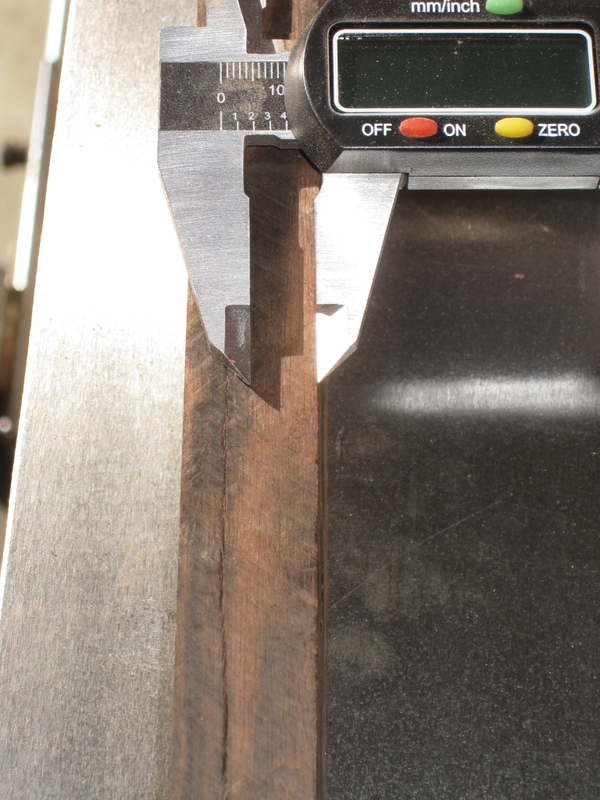 Leaving the blanks with their sharp edges after cutting on the saw means they're not particularly nice to handle. 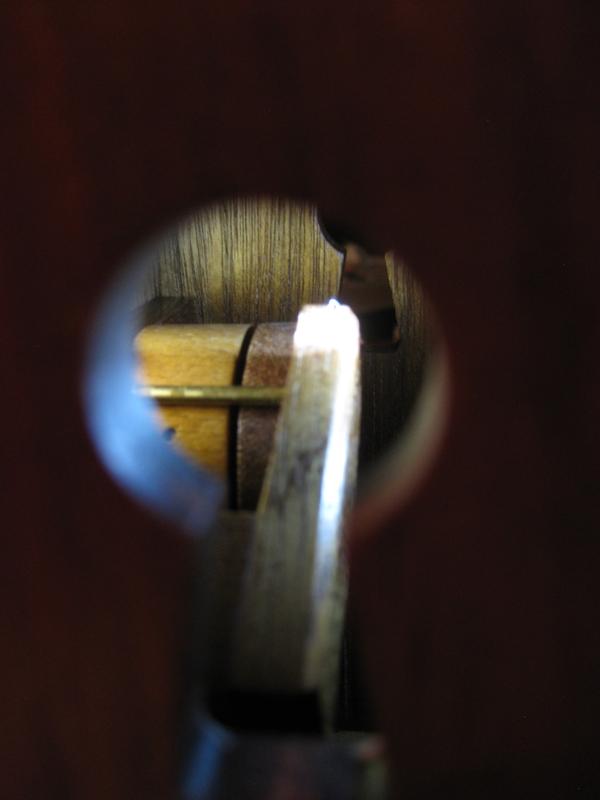 The sharp edges, especially on the Ebony which takes such a good edge mean that the pieces are not particularly tactile, and need a little softening. Putting a small chamfer on the edges takes the harshness from the pieces. Initially I was planning to put a roundover on the pieces, however the roundover bit I have didn't give me a pleasing result, so I decided against it. The benefit of having the spare dominoes meant I could experiment without worrying about something not working. 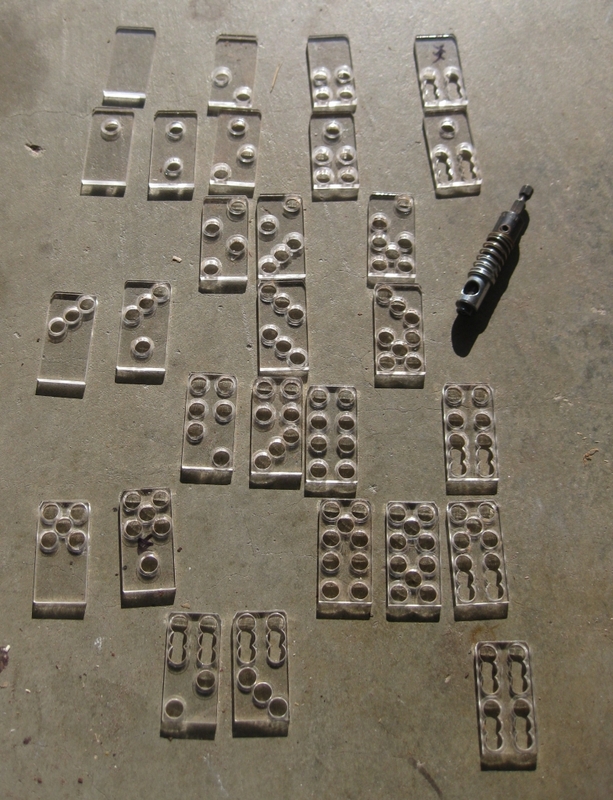 With the chamfers finished, it was time to make these domino blanks into dominoes. The bag of spot cutting templates I received contained all 28 blanks needed, including a double zero tile. I assume that whichever company was making the templates had issues that someone out there forgot to make a double blank, so they had to include it. I took the time to separate the templates into their groups, just to make sure I had everything I needed before starting. 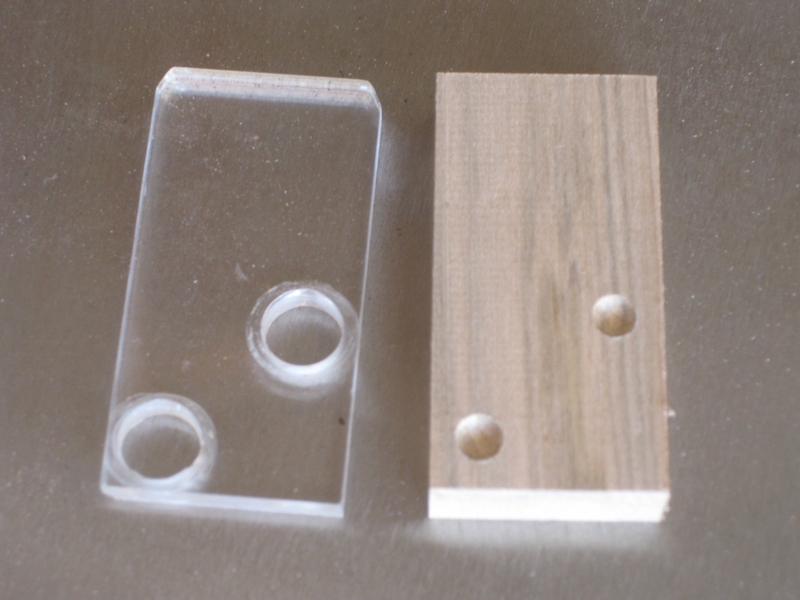 Using one of the spare domino blanks I'd cut earlier, I tested the template and spot cutting drill bit to see how they worked together, and get a feeling for how to cut the spots. I added a couple of shims to make sure the blank was positioned correctly under the drill bit template. The drill bit itself is rather clever. There's a collar on the end of the bit, which drops into the hole in the template, and when you push the drill down, the rounded cutting head protrudes below the template to make the cut. The jig holds both the domino and the template in the same fixed location allowing for consistent spot placement, and no chance of spots becoming oval shaped. The end result is well placed, consistently positioned spots which are all the same depth, with virtually no thought or skill required from the operator. I'll count that as a good thing, as it would be all to easy to ruin hours of work without the template and special bit. After a couple of hours work with the drill, I had 56 dominoes cut. The two full sets look great, but sadly I'm not finished yet. The central divider needs to be added to each domino, and I need to make a new crosscut sled where the blade is at 45 degrees to the table in order to add that detail. I then also have the difficult choice of whether to ink the spots or not. As you can see from the original dominoes I have, the spots are accented by adding the black ink to really make them stand out. Before I make a final decision I'll test out a couple of options and see what works best. 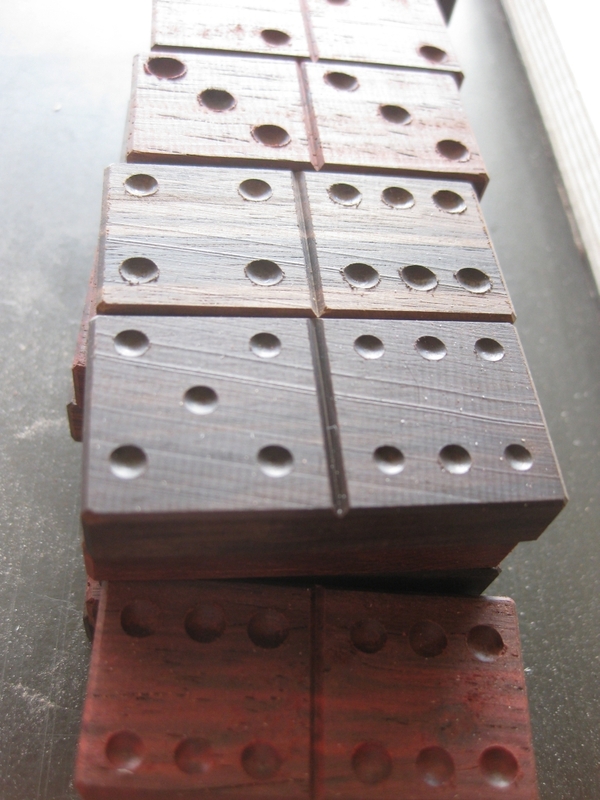 The observant among you may have been wondering why some of the Ebony dominoes are red. 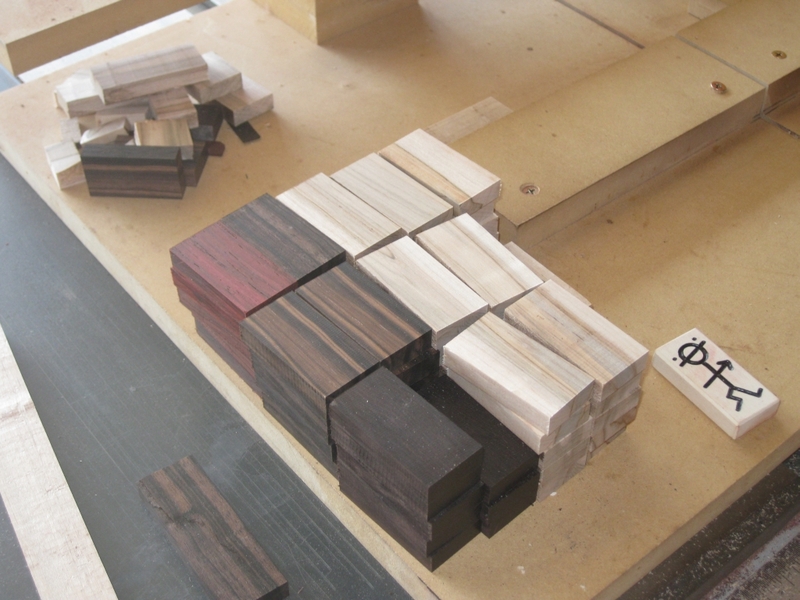 When I started working the Ebony blocks, one of them had the red tint to the wood. Personally I love the red tint, and wish I had more of this wood. It will eventually oxidize back to the dark black that you can see from the outside of the original block, but I'm going to enjoy the red tint while I can! In the next post, I'll finish up the dominoes before putting them into the puzzle, and enjoy solving it for the first time.